Sweet Potato (87%), Batter (Maize Flour, Rice Flour, Modified Starch (Maize), Garlic Powder, Rosemary Extract, Tapioca Starch, Maize Starch, Onion Powder, Herbs, Yeast Extract, Tapioca Dextrin, Pepper Extract, Natural Colour (160c), Turmeric Extract, Stabilisers (415), Garlic Extract), Sunflower Oil. Preheat oven to 180°C fan forced for 10 minutes. 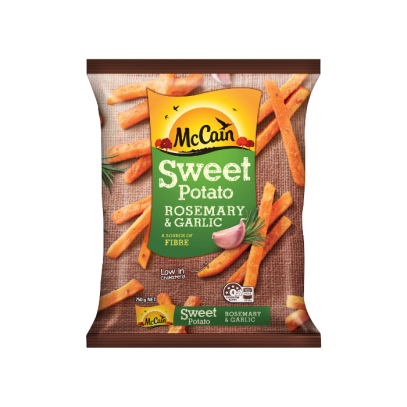 Spread McCain Sweet Potato Rosemary and Garlic chips in a single layer on a baking paper lined tray and place in the top half of the oven. Bake in oven for 10 minutes, turn and continue heating a further 8 – 10 minutes until they are lovely and crisp. Regular turning is unnecessary.